I have stunning powers of concentration. When I am engrossed in a book (or in my work, even though I much prefer a book), the entire world vanishes. You can walk into my office and when you start to speak, you have to scrape me off the ceiling. I once had a ecology-minded job where all the lights were motion-sensitive. I sat so still the light kept going off while I worked. Maintenance had to cripple the switch in my office. It’s not that I’m not paying attention. It’s that so many other things are interesting too. I like re-seat the attendees in my mind. I think of it as creating order out of chaos. First of all, there’s COLOR. I will group those people wearing black, then brown, then blue, green…well, you get the idea. Sometimes I wish I could make everyone get up and sit in the more visually appealing scheme I have designed. Then there’s HAIR. I like to rearrange from short hair to long. I am always in the middle. There’s WEIGHT of course, and again, I’m in the middle. This gives me comfort. For ladies only, there’s MAKEUP. Au naturel: to the left, please. And as I work in a very ‘earthy’ industry, I need a lot of room to my left. I envy those women with perfect complexions, and lashes that don’t need mascara. I am not one of those women. Also for girls only, there’s JEWELRY. I’m at the top in the ‘dripping in jewels’ category. I place a little lower in MANICURE. And at the bottom in BOSOM. Years ago (because I’ve been doing this as long as I’ve been attending meetings) I was the smart-alecky kid. Then I became the fresh-faced young manager. Then, the successful executive. And not long ago, the wise veteran. Yesterday, when I looked around the room, putting everyone in order, there I was: The Old Lady. This is something new to me: rearranging folks by categories. Of course, I never attend meetings, so I don’t have the opportunity. Looks like a fun game though. When I’m in a situation where I can’t leave, and I’m totally bored, I find a (preferably) long word on a sign or a book, etc. and come up with all the smaller words I can make from it. Next time, I’ll try your game! Hey, I DO THAT TOO! And I take words and break them up into two’s, and list famous people with those initials. Like “Famous” for example FA= Frankie Avalon, MO= Maureen O’Hara, US= Ulysses Simpson Grant (I cheat a little). 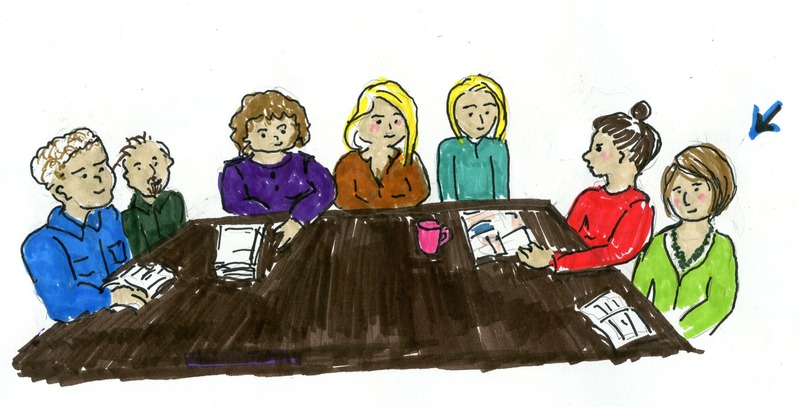 Do you create your fabulous illustrations while sitting in those meetings too? I can’t make it that obvious. But I do plan my drawings at moments like these. While I have a few OCD tendencies as well I’d never thought to group in that fashion…. I can tell that from now on I’ll be completely unable to focus in meetings! Great stuff…and, like you I will most likely be the oldest. Love Diane’s idea as welll…who knew blogging would lead to new tools like these. My thing is counting, letters, tiles, motifs on wallpaper. I never considered that my issue might be OCD – but now that you mention it… you know, I WOULD feel much better if I could seat folks so that their shirts did not clash. I would not want to seat them by age though. I regret that I did not have these wonderful survival strategies when I was an administrator sitting in an endless stream of meetings. I assure you, though, these techniques will be put to good use! I will never be the oldest… I may be the one with the most life experience; therefore, the wisest, but NEVER the oldest! I think meetings should be conducted standing up. They would be shorter, don’t you think? Standing-up meetings would be much better! Can’t do anything about the age thing, so I’m going for “old but still hot”. You definitely qualify! I like to organize people so that a “sleeper” on my staff is always seated next to someone who looks at me for guidance. That way I can indicate whether someone needs to be awakened for their input. It would be more problematic that everyone falls asleep at our meetings if the boss wasn’t the first one to doze. To stay awake myself, I color in whatever document we’re discussing, because I can’t draw. True for me most of the time, but sometimes when I practice yoga alone, I am also the oldest, stiffest, and slowest. I always liked finding “pictures” in the wood grain – that is – if there was any wood grain. Nowadays, since I’m back to recording secretary and the meetings are taped, I do the “find the little words in the big word” game. At the last temp job we all brought our laptops and the boss was out of state and hooked up via the conference phone-we sent funny instant messages back and forth and put the phone on mute so the boss wouldn’t hear us laughing! When I was in a yoga class….consentration went out the window when my instructor sat cross-legged in shorts which revealed way too much (or, way “too little” lol). I can consentrate when I want to on most things and actually get annoyed if disturbed. However, if I’m bored (meetings) the faces and stuff in wood grain, counting chins, who has crud under their fingernails (eww) and doodling are my entertainment. This is a good one! But at least you are the old lady who is wearing lots of great jewelry! In my pre-retirement life, when I had to attend boring meetings (they were mostly all boring), I always took a seat facing the parking lot…that way I could spend my time making up codes or phrases that people could use to remember their licence plate numbers–for example, GHY556 became “Going Home Yet–it’s 5:56”?…during one meeting that was particularly boring and was being conducted at head office (so we were listening in on a speaker phone), we placed ourselves on ‘mute’ and I shared my findings with my co-workers–we spent the rest of the meeting making up codes/phrases for licence plates and had a fun, productive (although not in a work-kind-of productive) half hour! I still do this when I read licence plates, even in traffic…maybe I could hire myself out to help others remember their plates…would come in handy for them at hotels etc when they need to know this information! What do you think? That is a fabulous idea! At this moment I have no idea what my license plate is – although I’ve had it for years. At least when I see it, I recognize it. That is such a cool idea – I would never have thought of it. Sounds like a good way to spend time stuck in traffic! THese are great ideas – I’m going to try some of them for faculty meetings. Oh, am I glad I read this. I hate meetings with the fiery hatred of a thousand suns. Rearranging my colleagues into categories has SO much potential to amuse and entertain. Thank you, thank you, thank you. I do not miss meetings! And I’ve never met a yoga class I didn’t sleep through by the end. Except that one time I brought the (then) 5 yr old to a Mommy & Me Yoga. Disaster! I never thought to mentally sort people in meetings, but that would DEFINITELY make them more enjoyable! And this might be my favorite drawing of yours yet! Thanks. I love to add my own quick art, and my husband gave me a scanner for Christmas (which I had been coveting). So it’s easier than ever for me to do. I bet you’re a super-organized person, with that kind of mental sorting ability going on. You’re probably ensuring all your brain synapses stay fresh that way. I’m going to try the names/initials game the next time I’m waiting somewhere. Yoga is absolutely the crazy-monkey-mind-can’t-focus place. It’s a bit like having an x-ray when they tell you not to breathe and that’s all your body wants to do right? The instant I’m supposed to focus on breath and let my mind be stilled, it rebels. Glad I’m not alone. I go to that place during Tai Chi. Sometimes, I just can’t concentrate because I want to MOVE, really move so, I sort all the beginners from those who look like they’ve taken a few classes, the men from the women, the singles from the married members and so on. I had no idea sorting was so popular. Tee hee. We played buzzword bingo at our staff meetings. I love your drawings. Do you paint? I paint a little (watercolor). I don’t have the patience though. When I work at a piece too long, sooner or later I screw it up. That’s why I like to do these sketches. They’re so quick. Your posts are always great, but your fun art makes them even better. I thankfully don’t have to attend meetings any more. So sorry I didn’t know this entertaining way to pass the boring parts back then!